Review: The author has taken the traditional approach of most dinosaur books that discusses each group chapter by chapter and turned it on its ear. In Dinosaur Odyssey Sampson is more concerned with what dinosaurs can teach us about the evolution of the Earth and our place in the intricate web of life than about any specific specimen of T. rex or Triceratops. Scott weaves an engaging story of the history of Earth and takes entire chapters to explain topics like the energy cycle and the soil formation, all the time relating these seemingly mundane topics back to why they are intimately involved with dinosaurs as living animals. And that’s where this book excels – making the dinosaurs and their world come alive while at the same time making the reader understand that the same processes that shaped the dinosaurs and their ecology also shapes ours today. Although the dinosaur’s extinction (except birds!) was caused by outside forces, the one staring us squarely in the eye is self-imposed. In many ways this book will, I suspect, act as a jumping off point for Scott’s long term commitment surrounding education and sustainability. Scott touches on the major advances in dinosaur palaeobiology and uses these to discuss at length his (developed with Jim Farlow) concept of ‘mesothermy’ to explain the success of the dinosaurs, especially the gigantic sauropods. In this ‘Goldilocks’ hypothesis dinosaur were not quite endotherms and not quite ectotherms, but something in between that that gave them the benefits of each type of physiology while minimizing their disadvantages. As a hypothesis this is fine but I still want to read the scientific paper that presents this concept in detail! 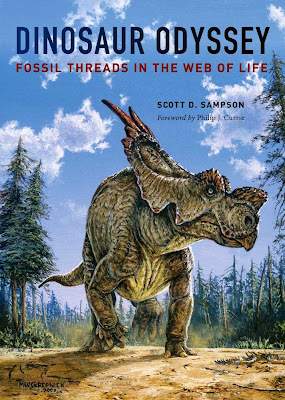 The real strength of this book is Scott’s ease at weaving sometimes dry or complicated topics into an engaging narrative that brings dinosaurs alive, and the book often works best when Scott is relating events that he was directly involved in. I’m hoping that he (or some member of the crew) will write a book about the work and adventures of collecting dinosaurs in Madagascar. The book is sparsely illustrated with an eight page colour insert, and a colour cover & evocative pencil illustrations by Michael Skrepnick that introduce each chapter. This book is written for someone with at least a high school understanding of biology and is, in a sense, an updated version of Bob Bakker’s Dinosaur Heresies for a new generation of palaeo-enthusiasts and palaeontologists to be. For the kids and their parents who know Scott as the host of the highly successful “Dinosaur Train”, here’s hoping that he writes a version of this book for the little ones. Finally, I have to divulge that Scott is an old friend of mine and at one time our research interests strongly overlapped. Those of you who know Scott for his charismatic speaking skills will be pleased to know that his passion also comes through in his writing. PS. Scott Sampson will be speaking and signing copies of Dinosaur Odyssey at the Cleveland Museum of Natural History this January as part of our Explorer Speaker series. More info here. Kevin Padian's "10 Myths About Darwin"